You are listening to ReachMD XM 160, The Channel for Medical Professionals. Welcome to The Revealing Retina presented by the American Retina Foundation, the charitable arm of the ASRS, the American Society of Retina Specialists. I am your host Dr. Roy Levit, Chairman of the American Retina Foundation, and joining me today is Dr. Allen Ho. Dr. Ho received his medical degree at Columbia University where he was Rudin Scholar. His did his ophthalmology residency and his vitreoretinal fellowship at Wills Eye Institute in Philadelphia. He is a professor of ophthalmology and an attending surgeon of the Retina Service of Wills Eye Institute. He is also a founding member of Mid-Atlantic Retina, is the principal investigator at Wills of several collaborative national clinical trials investing treatments for AMD and is an active member of the American Academy of Ophthalmology, the American Society of Retina Specialists, the Macula Society, and the Retina Society. Allen, welcome to The Revealing Retina. Today, we are going to talk about 2 of the most successful retinal surgical procedures that of repairing macular holes and macular pucker. Up until the advent of vitrectomy surgery, these were diagnoses for which there was really no cure. Allen, first give us a description of vitrectomy surgery and then we can talk about macular holes and macular pucker. Vitrectomy surgery is the surgical procedure that retina surgeons do under the microscope to remove the vitreous body in the eye. The vitreous body is that part of the eye that is clear and jelly like behind the lens of the eye. Most people think of eye surgery in terms of removing cataract surgeries, which is also highly successful surgery and commonly performed, we called that front of the eye surgery; vitrectomy surgery addresses issues in the back of the eye, for example bleeding, diabetic retinopathy, macular pucker, and macular hole, which we will focus on today. And vitrectomy surgery removes the vitreous, which does have attachments to the retina. How do you gain access to the back of the eye? The access to the back of the eye for vitrectomy surgery is made by little tiny incisions along the white part of the eye. One common misconception is that the patients think that their eye is going to be removed and then reposited back in their eye socket to do retinal or vitrectomy surgery, that's not the case. We can essentially leave the eye fairly undisturbed and make little, less than 1-mm incisions into the white part of the eye to gain access to the space behind the iris of someone's eye that is the vitreous cavity. So the openings are made in the sclera about 4.5 mm posterior to the limbus where the cornea and sclera met and how do the instruments remove the vitreous. The instruments remove the vitreous by using high-speed cutters to segment that vitreous body into small pieces and then aspirate it out of the eye. It is a technology that is involved significantly, just as cataract surgery has done to refine the removal of the vitreous gel and get to the retinal surface with the least amount of trouble in the most safe fashion. As you implied, the vitreous body is attached to the retina in many spots and in many conditions for which we do vitrectomy surgery, so you want to have an instrument that removes it as atraumatically as possible in our current technologies with vitreous cutters essentially like a little packman making little tiny nibbles away at the vitreous at a very high speed with suction and infusion into the eye allows us to maintain the eye at a stable volume, stable pressure, and remove the vitreous gel safely. So the instruments can work really very close to the retina without causing any traction on the retina. And the technology today has even smaller instruments that do the same thing? Yes, there has been a move towards miniaturization of incisions in the eye for all types of eye surgeries in the front and back of the eye and the object is not to be smaller for smaller's sake, the object is so that patients heal after, patients are more comfortable after surgery, and often times after cataract or vitrectomy surgery even, the eyes with fairly white and quiet and undisturbed. And this is done as an outpatient? Yes, most patients will have outpatient surgery for eye surgery whether it's anterior segment or posterior segment, that is cataract surgery or vitrectomy surgery, that is, they come in morning and go home the same day with local anesthesia. One other thought about vitrectomy surgery is when you are removing the vitreous body, the volume replacement is with what? What we put back is a saline solution. As it turns out, the vitreous body itself natively is made of 99% water and collagen fibers. It is really an optically clear media and so what we replaced it with is an optically clear media that is the water and not replacing the collagen affords no problems there. Okay, good. So we got an idea of how the back of the eye is operated upon and now let's talk about macular hole surgery or at least the diagnosis of macular hole and I will let you take it from there. Macular hole. Let's talk about some basic definitions first, and we often use the analogy as the eye is like a camera where the front of the eye has a lens and that can become cloudy and can become a cataract in that's where cataract surgery and a clear lens implantation can be performed. When we talk about the camera analogy with the eye, we talk about the retina, which is the film in the camera, that is, the thin layer in the back of the eye just like a camera has a thin layer of film in the back of the eye. The word macula specifically refers to that part of the retina or the film in the camera that gives a central vision, that is the ability to read a book, see somebody's face, drive a car, so we when talk about macular diseases, we talk about diseases that typically aren’t blinding where they leave someone in the dark, but typically where they would afford blurry central vision like distortion when you are reading. Several conditions can cause macular diseases including age-related macular degeneration and we will focus on the surgical conditions of macular hole and macular pucker. A macular hole quite simply is a tiny little hole right in the center of the macula, the focus point of the retina, and the size of those holes can literally be pinpoint to way smaller than the size of tip of your pencil. When you develop a macular hole, patients will typically have sudden painless blurred vision and we make the diagnosis on examination. And what do you see when you look in? We see usually a clear vitreous cavity and we see the macula, which is normally smooth and has a slight normal depression in the focus point of the macula. We usually see a hole, which looks like someone took a little cookie cutter out and there is a loss of tissue there, an opening in the center. What causes that hole to develop? The typical causes of macular hole are age related and therefore just an aging condition with changes in the structure of vitreous gel in the surface of the retina. You can, however, see macular holes in younger patients when there is a history of trauma. And the hole forms because of vitreous traction? Yes, vitreous changes overlying the hole, which therefore can pull on the hole and sometimes create a hole by virtue of pulling either forward or pulling side to side or stretching. You referred to earlier the vitreous is attached to the retina in a variety of spots in the back of the eye and the fovea itself that is the focus point where the hole develops is one spot where there is an especially firm adherence. For those of you who are just tuning in, you are listening to The Revealing Retina on ReachMD XM 160, The Channel for Medical Professionals. I am Dr. Roy Levit and I am speaking with Dr. Allen Ho, and we are discussing macular holes. Allen, macular holes are treated surgically in what way. Macular holes are treated surgically with vitrectomy surgery and then a gas bubble instillation. It was just in the 1980s that Dr. Neil Kelly and Dr. Robert Wendel from Northern California proposed the idea that a macular hole could be repaired with vitreous surgery. Previously, this condition, which is actually not that uncommon in senior Americans, were simply left alone because we had no therapy, so people would lose vision and we'd have no treatment. Now, we do vitrectomy surgery; we remove the vitreous jelly from the eye and sometimes some of the surface membranes that are on the surface of the macula that may allow the macular hole to close more easily, once we remove those membranes, then we put a gas bubble in the eye and then the tough part happens for the patient. They typically have to keep their head down for a few days or a week to allow the gas bubble to help promote closing of the hole and over time many patients will recover vision because we can close 90% of macular holes with that revolutionary surgery. And in fact you are relieving the traction on the hole and with the gas bubble putting a foam in the eye to hold the hole close while it heals. That's a great analogy, ya. And the gas that's put in, if you will describe that. During the vitreous surgery, instead of filling the eye with fluid at the end of the case, as we normally do, we will fill it with a temporary gas bubble that will stay in the eye hole between 4 and 7 weeks. We use that gas bubble again to gently keep that macular hole closed. When the macular hole closes and the vision cells come closer together without fluid underneath them because the hole is closed, patients can have improved central vision. And the reason for positioning face down is to put the gas bubble, which rises in fluid against the hole. 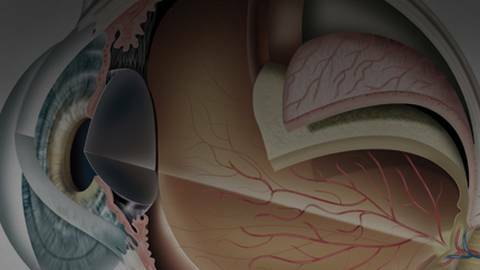 Macular pucker surgery is related in that you are also removing a membrane from the surface of the retina. That's correct. Macular pucker refers to a wrinkle on the surface of the central retina or the macula and it is in fact now our most common surgical procedure when we do vitrectomy. The number 1 indication is wrinkling on the surface of the retina. What patients will proceed when that happens is distortion of vision, blurring of vision, again painless, and for example, someone might look at a door and the straight line of the door will appear wavy that can be one common symptom that patients will report. The membrane that causes this wrinkling is it a naturally occurring membrane on the surface of the retina or is the growth of cells on the surface. The macular pucker or wrinkling on the surface of the macula is a growth that occurs over time. When the vitreous jelly is intact and attached to the macula, as it is in children, there is no place for a scar tissue to grow on the surface of the macula. When the vitreous jelly separates, you can get cellular migration and therefore transformation into cells that will contract and create the macular wrinkle. It looks something like crinkled up Saran wrap and that's basically what we see, which is what causes the wrinkle of the vision cells and the blurring of vision. The aim of the surgery is to remove the crinkled Saran wrap that's growing on the surface of the macula to allow the macula to get smoother and hopefully afford improved quality of vision. And this is something also that can be related to trauma or to previous surgery. What is the visual recovery in the time period after macular pucker surgery? After any kind of macular surgery, macular hole or macular pucker, the surgical procedure itself and the discomfort associated with the small incision in the eye are really quite limited. Usually people are comfortable within a couple of days or even that evening of surgery. The eyeball recovers quite quickly with our new techniques. In terms of visual recovery that can take a couple of months. I know that some surgeries are done under local rather than general and the patient is aware of their vision and actually can see some of the instrumentation during surgery. Yes, I've had patients definitely make those observations about experiencing their surgery in ways that they find fascinating or it may be more information than they want to know. Right. Dr. Allen Ho, I would like to thank you for speaking with us about macular hole surgery and macular pucker surgery. I am your host, Dr. Roy Levit and I would like to thank you for listening to The Revealing Retina, presented by the American Retina Foundation. For more information, visit us online at www.americanretina.org. We welcome your questions and comments about this or any other show. Please send your e-mail to xm@reachmd.com or visit us at www.reachmd.com. Our new on-demand and our new podcast features will allow you access to our entire program library. Again, thanks for listening. What are macular holes and macular pucker, and how do we treat these conditions? Host Dr. Roy Levit welcomes Dr. Allen Ho, professor of ophthalmology and an attending surgeon in the Retina Service at the Wills Eye Institute in Philadelphia, to discuss back-of-the-eye vitrectomy for the treatment of macular hole and macular pucker. Before this surgical procedure, we had no cure for these diagnoses.